Wed., 16 Oct. - Tue., 29 Oct. Tue., 24 Sep. - Mon., 30 Sep.
See all 131 properties in Franz Josef Strauss Intl. Located directly on Munich Airport's property between 2 terminals, Hotel Novotel Muenchen Airport is a convenient base for travelers. 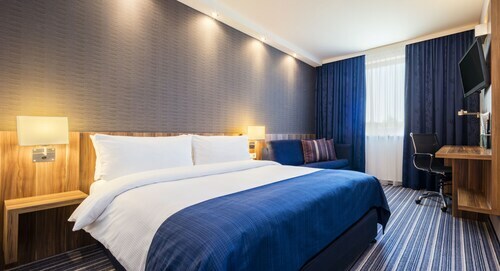 The hotel is a 40-minute metro ride from the city center, where popular Munich sights like the Marienplatz and the Kunstareal museum beg to be explored. Located in Erding District, this hotel is 4.4 mi (7.1 km) from Erdinger Weissbrau Brewery and within 12 mi (20 km) of Erding Thermal Spa and Weihenstephan Brewery. Munich Trade Fair and Olympic Rowing Course are also within 20 mi (32 km). 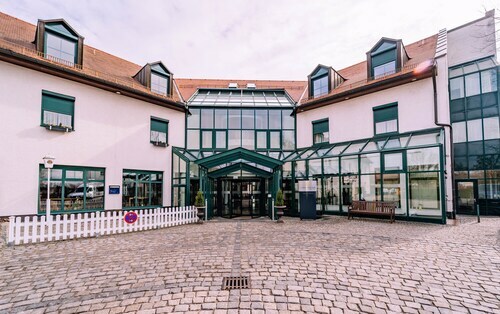 Located in Erding District, this hotel is within 9 mi (15 km) of Erdinger Weissbrau Brewery, Erding Hospital, and Erding Thermal Spa. Freising Cathedral and Weihenstephan Brewery are also within 12 mi (20 km). Located in Erding District, this hotel is 3.8 mi (6 km) from Erdinger Weissbrau Brewery and within 12 mi (20 km) of Erding Thermal Spa and Weihenstephan Brewery. Munich Trade Fair and Olympic Rowing Course are also within 20 mi (32 km). Located in Erding District, this hotel is 3.6 mi (5.8 km) from Erdinger Weissbrau Brewery and within 12 mi (20 km) of Erding Thermal Spa and Weihenstephan Brewery. Munich Trade Fair and Olympic Rowing Course are also within 20 mi (32 km). Located in Freising District, this hotel is within 9 mi (15 km) of Freising Cathedral, Erding Thermal Spa, and Weihenstephaner Perennial Gardens. Weihenstephan Brewery and Erdinger Weissbrau Brewery are also within 9 mi (15 km). Located in Erding District, this hotel is 3.6 mi (5.8 km) from Erdinger Weissbrau Brewery and within 12 mi (20 km) of Erding Thermal Spa and Weihenstephan Brewery. Munich Trade Fair and Parsdorf City Outlets and More are also within 20 mi (32 km). Question : What is the cheapest airline flying from Montreal to Munich? Answer : Ticket costs are hitting highs of $7,367 over the next three months when flying to MUC from YUL. Check out Delta Air Lines, as customers have been buying tickets at just $1,056. Answer : With two total flight time options, Sunday provides the most flexibility from YUL to MUC. Note that the day with the most flight times from Canada is Thursday with 1,265. Question : Which airline has the least delays from Montreal to Munich? Answer : The current leader is Lufthansa with a 79% on-time rate. Don't spend more time waiting in an airport than you have to and stick with Lufthansa on this route. If they are late for some reason though, the average delay is about half an hour. Answer : Yes, you can change your departure or arrival date. If you wish to save a little cash in doing so, the cheapest day to fly in April is Thursday. Having flexibility in your travel plans means you can save more, so be sure to plan ahead when possible. Question : How long do most people stay in Munich on average? Answer : Of course, you're not most people, but if you were, you'd stay roughly 17 days. Question : How long does it take to fly from Montreal to Munich? Answer : This flight takes about seven hours and 35 minutes via Lufthansa. Until we get the glitches sorted out of our teleportation machine, this is still the one of the fastest ways to get from Montreal to Munich. Don't forget the six hours time change. So, synchronize your watches. Question : How many flights are there per day from Montreal to Munich? Answer : The number does differ by the day, but on average, you can expect two different choice of flight times when you book. The average route departing Canada currently has six different flight times per day, so expect fewer choices than you're used to.